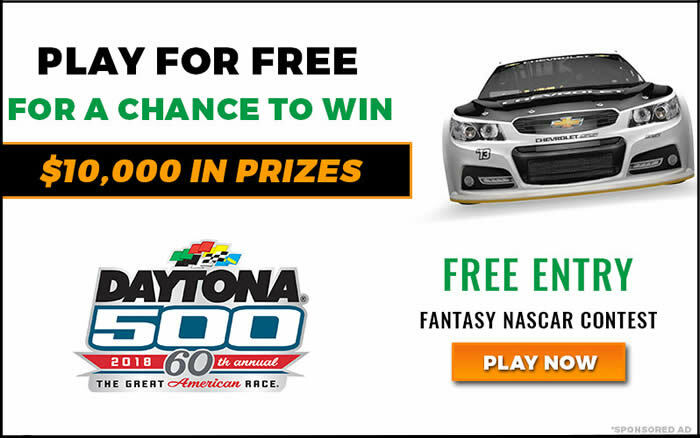 If you have never played Fantasy NASCAR, why not start with a FREE $10K contest for the 2018 Daytona 500? This Sunday, February 18, 2018 DraftKings.com is running a $10,000 Daytona Fantasy game which is 100% FREE to enter. To get started, simply set your roster here by picking 6 drivers and wait for the big race to start to cheer on your picks! Looking For an Even Bigger 2018 Fantasy NASCAR Contest? Really know your drivers and think you can pick a better group of 6 than other players? 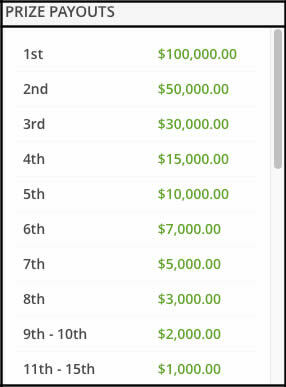 Then you should take a shot ot the DraftKings NAS Daytona $600K Contest with $100K for 1st place! DraftKings is giving away $600K this Sunday for their Daytona Fantasy NASCAR Contest. The top 9125 entrants get paid with $100,000 for 1st place! Simply choose 6 drivers to create your roster. See screenshot below for an example of how to create a lineup. - Trevor Bayne - $6900 - Bayne won the Daytona 500 in 2011 and is entering the prime of what could be a fantastic career. Although his past season wasn't the best, he did have 6 top ten finishes and he did finish 10th in last year's Daytona. He is a great Daytona 500 sleeper pick. - Kasey Kahne - $6500 - Finished 1st at the Brickyard 400 last year and was also had 6 top ten finishes. Placed 7th at last year's Daytona 500 and has 4 top-10 finishes at the Speedway. Choosing Kahne could pay off in a big way in your fantasy pool as he is an interesting Daytona longshot. Look no further - You have found the Best Fantasy NASCAR Contest for the Daytona on the web! Disclaimer: DraftKings nor RealMoneyFantasyLeagues have any association with the Daytona 500 or any other NASCAR league with respect to the outcomes of games/matches, etc... Fantasy contests are for entertainment purposes only. Check your local gaming laws for regulations regarding fantasy sports contests. Picks listed above are opinions only and are not guaranteed in any way to be successful or guaranteed to help to win cash or prizes. Play responsibly.